Total oil production in North Dakota decreased by 20 kbo/d to 1027 kbo/d in June, after a small increase (5 kbo/d) the previous month. I expect that we will see a few more months of similar decline rates (although there can be big monthly variations), given the low number of new completions. 43 wells started flowing in June, compared with 45 in May. Although I mentioned during my last update, that well performance in North Dakota, as a whole, is still improving, this observation did not consider that fewer wells are brought online since 2015. If we look at the performance of the top 100, or top 1000 wells in 2015 vs 2014, as measured by the cumulative oil return in the first 7 calendar months (which is all the data we have for all 2015 wells), then there is actually a small decline in performance. I found this quite surprising, as I expected to see some improvement from the larger fracs. What is new this time is the ability to see the well performance of individual wells. If you go to the “Well quality” tab, you will see a new filter “Well name”, which shows all the well names, and their API numbers. I recommend first using the other filters to narrow down the selection, and then using this filter to see the performance of individual wells. If you only have the API number of a well you want to see, you can enter this into the search box of the filter. I used this new feature to analyze the performance of old individual 2006-2007 wells. I was surprised to see how often there appear to be well interventions during the lifetime of a well. This new filter may also help in determining decline rates for wells late in life, as it allows you to filter out those wells that have had large interventions (e.g. refracs). This feature also allows you much easier to verify the data that I show in these presentations with any production data you are familiar with. For North Dakota, I use the production data from the monthly NDIC production reports, so if you encounter a difference, then please first check this with the relevant monthly report. Another small change is in the “Well Status” tab. I saw that there was some confusion on the meaning of the well status “Spud”, as some people thought this status applied only to the month in which the well was spud, but I used it also for all months after that, until first production. I’ve now split this status, into “1. Spud”, which only holds for the month in which the well was spud, and “2. DUC”, for all following months until production is started. Note that the typical meaning of a DUC well is that it is already completely drilled, but as I don’t have this information, I assign a well to this status already after it is spud. This change also makes it easier to compare the number of new well spuds, and the number of new wells that are on production for the first time (“3. First flow”). On Sunday August 28th, I plan another update on the Eagle Ford. The DMR folks have a status – NC – for wells that have been drilled to total depth (TD), with no completion (frac’ing) taking place, but I don’t know how one could access that without going to every well as it comes off confidential list. Bruce Oksol does this, but he checks it on a daily basis. I indeed have this well status, for all wells, except confidential wells. It is relatively easy to get this status for all wells, each month. The issue is that there are always several 100s of confidential wells for which the status is not shown. Therefore, if I would use this status to show the wells drilled to depth, I would always show an incomplete overview. Still, I might make further use of it in the future. I already use this status to determine which wells are plugged, as can be seen on the Well Status tab. I can’t believe the picture below. Whiting is similar. The evolution of completion technology never ceases to amaze. Thanks Jim, nice comparison indeed. The success of those early Sanish and Parshall wells has so far not been repeated. For some more perspective, check out the 2003 vintage in the US updates. These are exclusively wells in Montana Bakken, and they were even better than those early wells in Mountrail (ND). If you added some freedom for maximums on the x and ys of those cumulatives, it would help see how credible or ridiculous some of the 800 MSTBO and 1 MMSTBO claims being made are. Really like this portal- You are obviously a guy who has a way of grouping data in a common sense fashion that gets right to the point, unlike many pure scientists. Since Parshall is the best and likely most permeable, makes sense that this is the Canary in the coal mine for interference. That’s nice to hear Jim. What I’ve done there is to estimate the future output of all the oil wells I cover (and started production before 2016), by applying basin-wide decline histories. The presentation is a little dense, but you may find on the 2nd & 3rd tab the information you seem to be looking for. 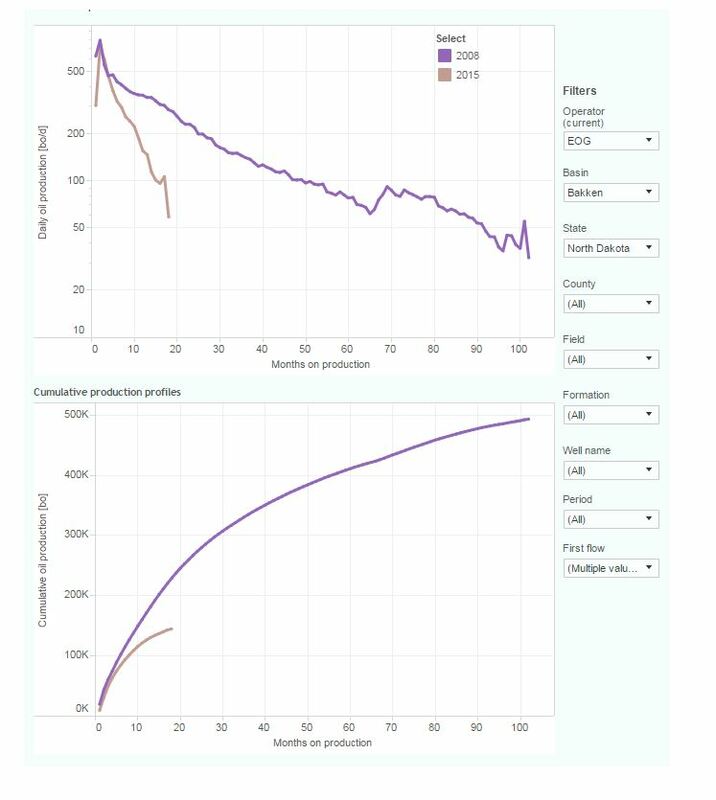 On the 2nd tab you can see the actual, and projected, production curves for all wells. On the 3rd tab, you can see for each basin the EUR, and you can narrow it down to selected operators & vintages. I also show there for each operator the actual amount of oil already produced from these wells, and the estimated remainder. That presentation shows that, when only looking at oil production, EURs above 500k BO are indeed hard to find, and that 150-300k is more the norm. Great site, Enno… and thanks for that link to Deadshot7 comments, very informative from someone in the game. Thanks for the great feedback Nodeywan! It’s not what Enno, etc, say- It’s what the data they report and he provides a portal too says!!! Spend your time trying to go through the data and prove it wrong. Otherwise, STFU. This site is indeed all about what the actual production data shows. Not more, not less. Like you, I’m trying to form a view based on this, and indeed there appear to be many places where opinions are being offered that are not substantiated based on all actual production data. Could you add the log scale option to the “Projecting Production” portal Well Performance section…. It would spread the curves out and enhance comparative ability across the wide spectrum of production rates I think. Great suggestion, thanks. I also like the semi-log plot when looking at the production profiles. Unfortunately, making this change in the software I use, is more work than one might think. I’ll therefore postpone this until my next update on that presentation. I’m not exactly sure yet when I’ll do that, but I’m thinking maybe in 3 months, once we have good data for all basins on what happened during the first half of 2016.